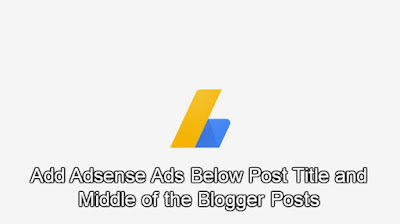 Add Adsense Ads Below Post Title and Middle of the Blogger Posts: Are you searching for a way to add Adsense Code Below Post Title and Middle of the Blogger Posts? Then you are in right place here in this tutorial I will show you How you can add Adsense code anywhere in BlogSpot posts. To earn good revenue from Adsense it is important to place ads at right place where users having more interactions. Adsense Code Below Post Title and Middle of the Blogger Posts can give you high CTR and you can earn more revenue. In WordPress platform, there are many plugins available by which you can easily add Adsense code anywhere on your blog but in the case of BlogSpot, we have to do this manually. Step 1: Go to your blogger account. Step 2: Now take a backup of your template for your safety.Then go to Theme tab and click on Edit HTML. Step 3: Now search this code <data:post.body/>. (Press CTRL+F to search).You may get this code more than one.So try with every <data:post.body/> code. Step 4:Now replace <data:post.body/> this code with the below code. Step 5: Since blogger supports XML format and Adsense code is in HTML format so you need to convert your Adsense Code to XML format. 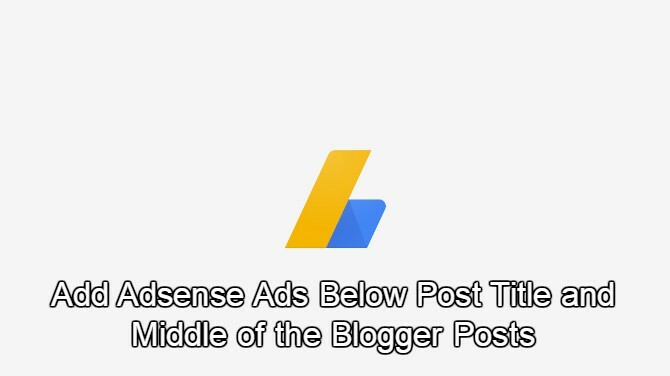 This is the only easy way to add Adsense Ads Below Post Title and Middle of the Blogger Posts. I hope you liked this post.So now please share this post using sharing buttons below to support us.